The goldenrod is coming out. I started seeing it on the roadside. It's often mistaken for one of the causes of sinus irritation in the fall, but ragweed is usually the culprit. Ragweed has white fuzzy blossoms and spread in the autumn wind like dandelions. Goldenrod on the other hand just stands there looking pretty and taking the heat from ill-informed sneezers. Poor goldenrod gets no respect just like the nice dandelion. My brother suffered badly from ragweed which was all around us growing up. Goldenrods are nice in bouquet of wild flowers, especially when they are starting to blossom. 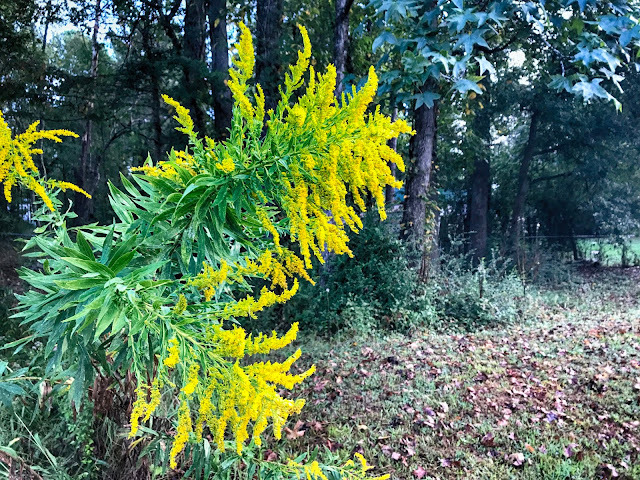 Shame on the ragweed to point the finger at the beautiful Goldenrod. Yes, golden rod is a beautiful flower and is often blamed for allergies, where ragweed is the culprit . Thankfully i'm not allergic to either and loving seeing both brightening up the roadsides. It seems that when the goldenrod is at its prettiest a lot of other yellow flowers are also showing off. These would look great in a vase. Everything that blooms wild is a culprit to me in all seasons. Beautiful photo, and delightful, informative narrative! When we lived in Maryland and Pennsylvania, the forsythia graced the roadsides; and in CA, it is the acacia - and the acacia is tough for allergies!